In her Aug. 26 Japan Lite column, Amy Chavez described the demographic crisis on the Seto Inland Sea island of Shiraishi, where the population is shrinking and aging as young people seek out opportunities on the mainland. Although this existential problem is threatening communities across the length and breadth of the archipelago, there are some positive examples of towns and villages that have bucked the trend by challenging the status quo. Their stories need to be told, not least because they can offer lessons to other small communities struggling to stanch the flow of young people to nearby cities. One such place is the small town of Ama (population 2,363), which covers the whole of Nakanoshima, one of the Oki Islands off the coast of Shimane Prefecture. 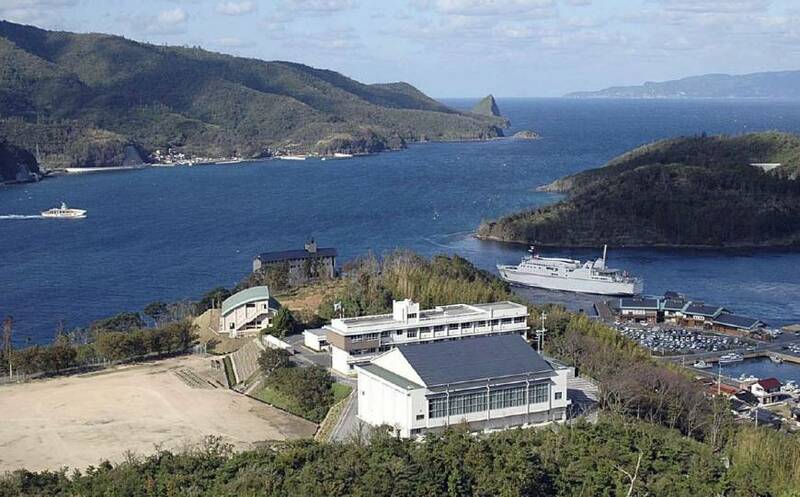 Nakanoshima is one of three islands that form the Dozen group, which is dwarfed by the neighboring island of Dogo. 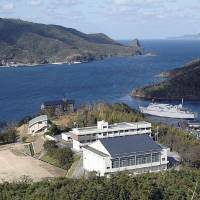 Together, Dogo and the Dozens make up the Oki Islands. In time past, members of royalty banished from court were exiled to Dozen. The islands are not fully self-sufficient, so islanders have had to rely on their own ingenuity as well as Dozen’s rich natural resources to survive. In the past few decades, however, migration to the mainland and a low birthrate have led to a worrying drop in the islands’ population. The local economy was brought to its knees as Ama grappled with a huge budget deficit. The local high school was on the verge of being closed down by the prefectural government because of record-low student numbers. The Miryokuka Project was set up to coordinate ongoing efforts to restructure Ama’s economy and education system. The project’s top priorities were to arrest the decreasing student population and improve the quality of instruction at the high school. In 2007 and 2008, polls and meetings with local people were conducted to increase awareness of the school’s dire situation and raise support for it. Parents were strongly urged to send their children to the school and urgent requests were made to the prefectural board of education to allocate it more teachers. Before the request, the number of teaching and nonteaching staff had dropped from 27 to 18 in just three years. Since 2008, staff numbers have rebounded to 33. Courses such as regional studies (chiiki-gaku) and career planning (yume-tankyū) were added to the curriculum thanks to the efforts of You Iwamoto, head of the Miryokuka team. Following publicity in the media about the school’s struggle to thrive in the wave of reforms, the number of students increased from 89 in 2008 to 156 today. Outside of regular school, the Oki Dozen Learning Center was set up to complement the school’s efforts to prepare students for national exams and future careers. There, students are presented with problems facing Dozen and are guided to churn out creative, feasible solutions in groups and individually. The staff at the center, including the director, Shogo Toyota, envisage that such efforts may lead to students choosing careers that benefit the islands’ sustainability. Generally, the learning center opens at 10 a.m. and closes at 10 p.m. daily. There are seven full-time employees who supervise students’ self-study between 4-6 p.m. and 7:30-10 p.m. Staff also attend to students in group studies during the weekend. In addition to being a cram/prep school, the center organizes weekly career seminars for students dubbed yume zemi, or “dream seminars.” Here, students are guided by the center’s staff to develop and plan concrete steps to help them achieve their short- and medium-term goals, such as gaining admission to good universities or training colleges, organizing events, doing internships and volunteering overseas. Also at yume zemi, students are taught business management models and concepts in the hope that they will use these tools to develop ideas that utilize Dozen’s resources. The center is planning to set up equipment that will allow experts on the mainland or elsewhere to instruct students live over the Internet. An audio-visual library of lectures from reputable cram schools around Japan as well as the learning center itself will be compiled and made available to students both at the learning center and in the school’s dormitory, according to Toyota. Before the Miryokuka Project took off in 2007, the town’s mayor, Michio Yamauchi, spearheaded administrative and fiscal reforms that resulted in a complete turnaround in the town’s finances from a deficit to a surplus. Leading by example in his pursuit of fiscal discipline, the mayor cut his salary in half. Other executives and workers at the town hall responded by cutting their salaries by various degrees, with lower-income earners cutting their salaries by smaller percentages than high earners. The citizenry also joined in by forgoing their subsidies for local transportation. The town hall began to look urgently into establishing businesses that would utilize local resources. This has resulted in a few public-private partnership ventures. One of these is a sea cucumber (namako) processing factory. The partnership involves a lease of the building and equipment by the town hall on one hand and the technical know-how and managerial competence of an “I-turn” on the other. (Loosely defined, an I-turn is a worker on the island whose hometown is on the mainland. A person who originated from the islands and has returned to work there is known as a “U-turn.”) According to manager Masaya Miyazaki, the factory exports a significant portion of its products to China. Another such venture is a freezing/storage facility set up using an advanced technology that preserves the freshness of the product — mainly fish — after freezing. The process, CAS (Cell Alive System), developed by ABI Co. Ltd. in Chiba Prefecture, gives the venture a competitive edge on the mainland since the products stay fresh even after their long journey to market. The administrative, fiscal and educational reforms undertaken by Ama town have been largely successful and have caught the attention of educators, academics, politicians and the media in Japan. In May, Bruce Miller, the Australian ambassador to Japan, visited the town and the school. A week before that, NHK aired a profile of some of the key players in the Miryokuka Project. Yoshitaka Shindo, the internal affairs minister at the time, visited the school and leaders of the project in June. It is vital that reforms in Ama succeed in the long term for a number of reasons. First, both developed and developing countries stand to gain from Ama’s experience. Regardless of their level of development, countries are struggling to sustain rural life as a result of rural-urban migration, aging populations, the side-effects of outsourced production, poor or deteriorating infrastructure and, most commonly, a central government that is not prioritizing rural development. Resembling Ama in developing countries are what can be called “inland-islands,” i.e., towns and villages that are significantly detached or isolated from economic or political centers, such as national or regional capitals and major ports, mainly due to poor transportation and communication infrastructure. In terms of developed countries, Ama’s experience could serve as a template for pursuing urban-rural migration. Partnerships like that between the town hall and factory manager Miyazaki could be forged to bring in I-turns who are eager to make use of local resources. Such efforts are likely to create employment, make the community more self-reliant and arrest — and possibly even reverse — rural-urban migration. National and local governments counting on austerity measures to help revive their economies may find it helpful to study the success of fiscal reforms in Ama. Ama’s acquisition of advanced technology to give its businesses an edge also holds lessons for developed countries. Most local governments do not have the finances to fund research and development to aid agriculture, food processing, etc., and so special arrangements with universities and other research institutions are crucial. Educational reforms in Ama, particularly 1) creating courses that raise students’ awareness of local resources and how these can be utilized in business, 2) organizing career guidance classes and seminars, and 3) running a local learning center/cram school can be replicated to various degrees in other countries irrespective of their level of development. Sustainable island or rural development is not the sole responsibility of national or regional governments. We are the government, not the abstract entity that most of us consider it to be. Ama town is demonstrating that a sustainable future can be achieved when a community defines what development means to them and pursues it wholeheartedly by using glocal resources and partnerships.